First, we lay the theoretical foundation by reviewing Levy Processes and their properties. Next, stochastic time change techniques are discussed thoroughly, including subordinated Levy Processes, and general time- changed ones. 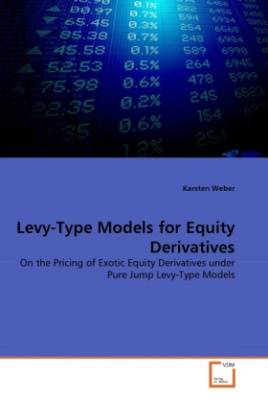 A general framework on how to price European options, and therefore on how to calibrate these models to market data, is presented and its implementation is discussed. Besides going over the properties of selected models, we will also demonstrate how to perform simulations of the desired quantities. Tests with real market data are carried out - we judge the empirical power of the models by comparing their t to market data, and analyze path behavior implied by the calibration procedure. This gives good intuition for the pricing of exotic options. In particular, we devote one chapter each to Barrier and Cliquet Options - and comparisons to quotes found in the OTC market.